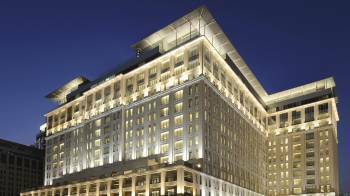 Located in the heart of Dubai’s most vibrant destination for business, restaurants, nightlife and a thriving arts scene, The Ritz-Carlton, Dubai International Financial Centre epitomizes luxury and elegance behind its stylish limestone façade. Guests of DIFC’s only luxury hotel enjoy a direct walkway to the city’s best restaurants and galleries, plus the added convenience of the city of Dubai at their fingertips. Meeting planners will discover one of the Middle East’s most dynamic business hotels near the Dubai Convention Centre, with a selection of meeting space perfect for both corporate and social events. The hotel offers more than 27,000 square feet of meeting space, including the stunning 15,000-square foot Samaya Ballroom with a private entrance, nine additional meeting rooms and plenty of versatile outdoor space. The hotel complements every event with legendary Ritz-Carlton service to ensure that every meeting is flawless.